The patch mainly moves around some graphic tile locations to make an editable 6x4 logo for the scoreboard and the 3 stars. The logos are two separate logos, so you can have 2 separate logos if you like, but they share the same palette. 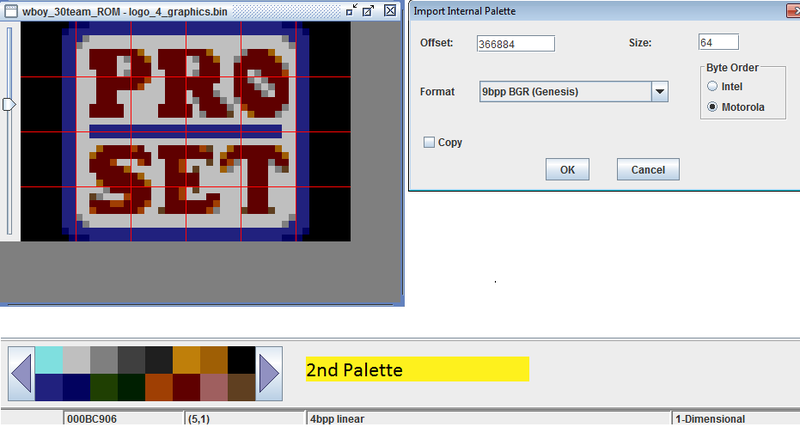 The scoreboard logo can be found in TM offset BC906, palette 366884, 2nd palette. 6x4 grid. The 3 stars logo can be found in TM offset 59364, palette 366884, 2nd palette. 6x4 grid. That had always bugged me and now it is fixed. The tiles on the scoreboard are a little off easy to fix but just FYI. Can you explain? Not sure what you mean by "a little off". Oh weird...I don't get that error. Did you apply the patch on a clean 30 team ROM, or one that had my 1st patch (scoreboard only) applied already? Many thanks King for doing this Hack! This and the stick tape eyes hack are the 2 best graphics hack imo. They just add so much visually to the game. I am updating all my Original 6 roms. This also reminds me that I should type up the notes on exactly how this was done. I did it during the forum transition and it was too much for me at the time. I'll put it on my to do's. I am loving this Tool. Raph made this Coor's Light one for ETB.